Mumbai: Foreign institutional investors (FIIs), who took a break from buying Indian shares in August and September, are returning after recent government announcements such as the Rs2.11 trillion PSU bank recapitalisation plan. FIIs are mainly buying into new shares. Over October and November so far, FIIs have invested a net of $1.9 billion in Indian equities. For the year to date, they are buyers to the tune of $7.4 billion. “It is the general pick-up in global inflows to emerging markets, and India is gaining. Also, the recent bank reforms in India are leading to expectations that there could be more reforms underway," said Gautam Chhaochharia, head of research at UBS Securities India Pvt. Ltd.
On 25 October, the government said it will infuse Rs2.11 trillion as equity into public sector banks and spend Rs7 trillion on building roads over the next five years. “Our stance has remained overweight. India is one of the best structural growth stories in emerging markets with substantial room for credit expansion. This and ongoing reforms should keep valuation levels elevated. Risk of a derating is low," said Maarten-Jan Bakkum, senior emerging markets strategist at NN Investment Partners, in an email from The Hague, Netherlands. “The recently announced recapitalization of the public sector banks made the investment case for India stronger." Indeed, after the bank recap announcement, overseas entities such as Citigroup Inc. and Goldman Sachs Group Inc. raised their target prices for Indian stocks. Optimism among FIIs seems to be widespread. While flows to Asia ex-Japan country funds were mixed in the week to 1 November, commitments to both Korea and India Equity Funds hit a 13-week high even as China Equity Funds recorded their second straight week of outflows in excess of $600 million, EPFR Global, which tracks fund flows, said in a note on 3 November. Also, dedicated Brazil, Russia, India and China (BRIC) equity funds posted consecutive weekly inflows for the first time since early April as well. “That said, valuations are a bother too. I would say FIIs are starting on a gradual note," said Chhaochharia of UBS. Currently, the Sensex’s one-year forward price-to-earnings ratio is 18.61, close to the highest so far in this fiscal year. To be sure, a surging primary market has attracted a lot of foreign investor interest. Data from Prime Database showed that Indian companies raised a total of Rs1.39 trillion from the primary market in 2017, exceeding the previous high of Rs1.04 trillion in 2010. 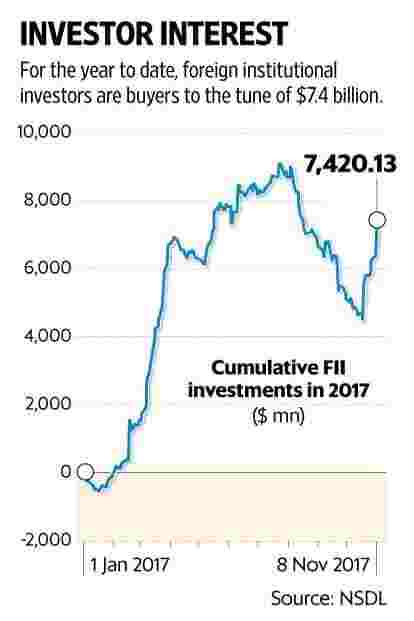 FIIs, who were net sellers in the secondary market to the tune of $3.43 billion from the start of the year up to 31 October, have simultaneously pumped in $9.41 billion in the primary market alone, their highest in the last seven years, Edelweiss Securities Ltd said in a note on Thursday. In November, they have invested $1.5 billion in the secondary market. The smaller number in the secondary market means that some experts are sceptical. “They (FIIs) have just started buying, but the numbers are still very small, in fact nominal," said Rikesh Parikh, vice-president, institution corporate broking, Motilal Oswal Securities Ltd. “We need to see if the trend sustains, and is here to stay."